So you’re all ready to get a killer ab workout in but you forgot your mat! Now you have to get down on that nasty gym floor or carpet that hasn’t been cleaned in who knows how long! GROSS! 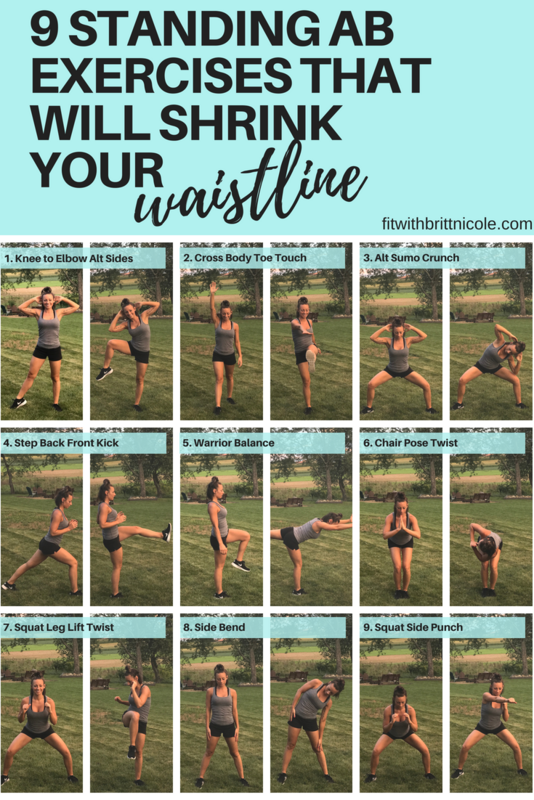 But no need to worry, because here are 9 amazing standing ab exercises that will help to shrink your waistline and tone that tummy. And the best part…you get a great core strengthening workout without ever touching that disgusting floor! The key here, just like any other workout, is to focus on the muscles you are working. Focus on your abs, obliques, and back. These are the muscles that need to be engaged if you want the best results out of each exercises. It is also important to use slow, smooth, and controlled motions with each movement! Quick jerking motions will increase your risk of injury. Be safe my friend! WARNING!!! This standing ab workout is going to burn girl! For each exercise you will do 25 reps, or as many as possible if you can’t make it to 25 yet. If it is a timed exercise you will do 30 seconds. Take a 30 second break between each exercise and repeat for 2-3 rounds! Click the "Pin It" Button! Do you love quick and effective workouts like this that you can do at the home or in the gym? I know my clients do! That is something that I focus on in my Holistic Body & Life Transformation Coaching and one of the main reasons that my ladies see such great results. They have an easy to follow workout program that is custom designed to fit their busy schedule. So if you're sick of spending hours on the treadmill because you think that's the only way to lose weight or you just don't know what else to do, then click the link below. You will be asked to fill out a few quick questions so I can learn more about you and your goals! You got this girl! If this workout is a little difficult, do your best and try it again in about a week to see how much progress you make. Push yourself a little harder each time! Get Your FREE Holistic Eating Grocery List! Finally learn what's ACTUALLY healthy and what's NOT so you can grocery shop like a boss! I want the Holistic Eating Grocery List! Need more help with finding nutrition advice that works for you? Abs & Cardio Workout for Busy Women! 5 Super Easy Daily Habits for Weight Loss! Spring Weight Loss Smoothie Bowl Recipe! Just enter your name and email for instant access to start the FREE 5 Day Challenge to Reduce Bloating for GOOD! I'm Ready to Get Rid of This BLOATING!